No gas or vapor is capable of warming the Earth. Yes it is. It does so in multiple ways. The main thing it does is moderate temperatures. It reduces high temperatures and increases low temperatures. Gases in general cool the surface by convection, which drastically reduces outgoing radiation (Stefan-Boltzmann Law). The Stefan–Boltzmann law describes the power radiated from a black body in terms of its temperature. A black body is an idealized physical body that absorbs all incident electromagnetic radiation, regardless of frequency or angle of incidence. The Stefan–Boltzmann equations do not apply to atmospheres. Mostly correct. That is why I referred to the 'surface' of the earth which though not an ideal black body, still emits radiation proportional to T^4. Note that O2 and N2 do not act at all like a black body since they do not absorb and emit EM radiation in a range we care about. CO2 and H2O do absorb and emit EM radiation at certain narrow bands and have some characteristics of a black body. Radiation emitted at those ranges is still proportional to T^4. But they are trace gases. 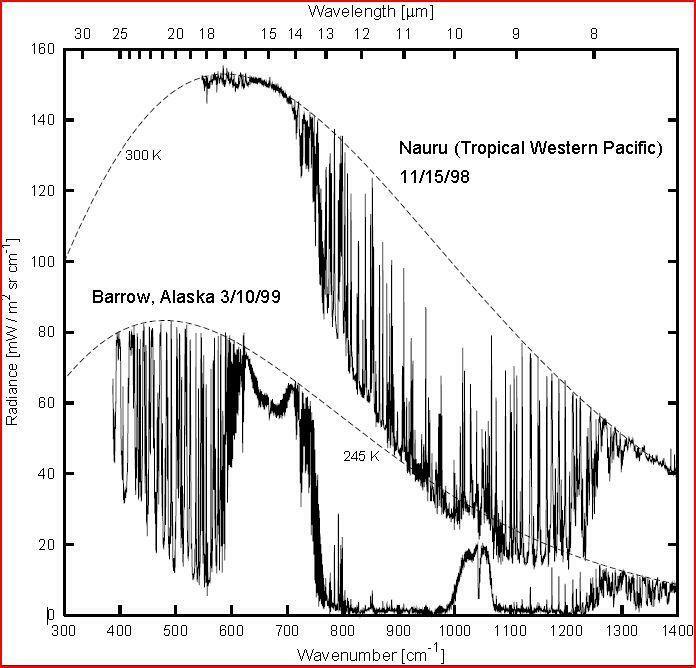 It is interesting to note that the CO2 in the atmosphere emits radiation in its narrow band at about 220 K (-53 C). Not "mostly correct", entirely correct. I posted, verbatim, the definitions of both the Stefan–Boltzmann law and black bodies. Look it up. The Stefan-Boltzmann equations have absolutely nothing do with atmospheres, gases, or chemical combinations. To even try to draw some kind of inference that there may be a correlation demonstrates a fundamental lack of understanding. To see if I am correct, take a spectrometer, point it into the sky (not the sun) and see if you can get a temperature of the CO2, O3, or H2O. You will be able to. The N2 and O2 are invisible. So is CO2, O3, and water vapor. Look at the wavelength around 667. You will see that the CO2 is warmer in the tropics. This chart does not show temperature. You can also estimate the temperature of the H2O and the ozone if you know what wavelengths to look at. You will also see that in Alaska, where there is very low humidity to interfere, that the O2 and N2 do not record a temperature. The spectrometer uses the principles of the Stefan-Boltzmann law. No, YOU are using the Stefan-Boltzmann law with random numbers. It is meaningless. The dotted line represents an ideal black body temperature. No, it does not. It represents the ideal Wien curve. The dotted line that the CO2 portion falls on will give you a good estimate of the temperature of the CO2 above you. Look at the wavelength around 667. You will see that the CO2 is warmer in the tropics. It can be measured. You can also estimate the temperature of the H2O and the ozone if you know what wavelengths to look at. You will also see that in Alaska, where there is very low humidity to interfere, that the O2 and N2 do not record a temperature. The spectrometer uses the principles of the Stefan-Boltzmann law. The dotted line represents an ideal black body temperature. The dotted line that the CO2 portion falls on will give you a good estimate of the temperature of the CO2 above you. If your assertion is correct, a spectrometer would be a flat line if you were looking into space. The Stefan-Boltzmann equations only apply to an abstraction of a physical concept. WRONG. It applies to all bodies, including gray ones and ideal white ones. You are attempting to change the equation again by removing the emissivity term. The ideal black body is a reference point, not an equation. There are no black bodies on Earth, nor is Earth or any chemical a black body. Irrelevant. The Stefan-Boltzmann law applies to ALL bodies. Even real ones like Earth or it's atmosphere. You are misapplying the law because you do not understand it. No, YOU are trying to change it! Your graph, by the way, fails to take into account that by March 10th Barrow was getting less that 12 hours of daylight and had just come out of 90 days of total darkness. One thing about O3 that less scrupulous politically motivated people never tell you is that it requires sunlight, or more specifically, UV radiation to make O3. Nope. You can make O3 very easily. Just take oxygen and shove energy into it. Electrical energy, high temperatures, impact, UV sunlight, etc. It's a natural unstable molecule and will break down to O2 after a while on its own. UV sunlight also breaks down O3 into O2. It is true the Chapman cycle ceases without sunlight. Oh, look an ozone hole over Barrow (now known as Utqiagvik), Alaska! Imagine that! You do correctly identify the source of the polar ozone holes. The Stefan-Boltzmann equations only apply to an abstraction of a physical concept. There are no black bodies on Earth, nor is Earth or any chemical a black body. You are misapplying the law because you do not understand it. As in all laws of science, it is applied in non-ideal conditions. Correct. The ideal black body is nothing but a reference point. It's still completely accurate too. You sound like ITN in your rigid adherence to a definition. The definition of the Stefan-Boltzmann law does not change. Why should I allow someone to change it? The Stefan-Boltzmann law states that the total energy radiated per unit surface area of a black body across all wavelengths per unit time j (also known as the black-body radiant emittance) is directly proportional to the fourth power of the black body's thermodynamic temperature T.
Pay attention to the term proportional. That leaves room for gray bodies and elements that only emit a portion of the spectrum such as gasses. WRONG. The proportionality is no factor here. The emissivity term deals with gray bodies. Gasses emit across the spectrum, just like solids and liquids. As in all laws of science, it is applied in non-ideal conditions. It is still useful. You sound like ITN in your rigid adherence to a definition. Of course it is applied in "non-ideal conditions," but that does not make the conclusions correct. The Stephan-Boltzmann equations are used in calculating stellar habitable zones, but only as approximations. It is not used for this purpose. Nobody has ever claimed any planet must have a specific surface temperature based upon the Stephan-Boltzmann laws. The Church of Global Warming does. They are wrong, because they are using random numbers in the equation. Welcome to your new paradox. They are only suggesting what the surface temperature of an idealized abstract black body would radiate according to Stephan-Boltzmann. WRONG. The Stefan-Boltzmann law applies to all bodies, black, gray, or white. It applies to all states of matter, solid, liquid, gas, or plasma. You are attempting to apply Stephan-Boltzmann to the real-world as an absolute, and that is where you are making your mistake. Stephan-Boltzmann has absolutely nothing to do with the practical world, because there is no such thing as a real physical black body that is able to absorb all electromagnetic radiation, regardless of the angle of incident. It is entirely a theoretical construct. You are AGAIN attempting to change the equation! You can't just remove the emissivity term! ...I've tried to explain ad nauseum that black body radiation actually references steel and the new science at the turn of the 20th Century. It applies to ALL materials. It applies to all ages. Any theoretical relationship would need to exist between water and atmospheric gases as the difference in density is about 1,000:1. The relationship is equality. It applies to ALL bodies. Density has nothing to do with the equation. The exchange rate of heat is expected to follow accordingly. Heat does not follow energy density. It follows temperature difference and coupling between the two regions. But the radiation through an atmosphere or anything else that is selectively opace to light of different frequencies can cause the surface to be warmed or cooled vs it's "normal" state. That may very well be true, but it cannot be calculated using Stefan-Boltzmann since none of those elements in the atmosphere are black bodies. Stefan-Boltzmann only applies to black bodies. At the very best all you can do is approximate. (1017) A black body in thermal equilibrium (that is, at a constant temperature) emits electromagnetic radiation called black-body radiation. The radiation is emitted according to Planck's law, meaning that it has a spectrum that is determined by the temperature alone (see figure at right), not by the body's shape or composition. An ideal black body cannot exist in nature. an ingot of steel or a star is hot enough where just using the Stefan-Boltzmann law to calculate the temperature is useful. You can get black body sources to calibrate your IR meters. however they are not nor claim to be ideal black bodies, however they are black, the earth is not, a diffuse gas is certainly not as you can see through it in visual frequency. ...Planck's work regarding black body radiation was using steel. In this video you will see black light emanating from the steel. That is black body radiation. You'd probably need to read his autobiography, one written years ago to get a better understanding of his work. WRONG. It applies to ALL bodies. The ideal black body is a reference point, not an equation. The Stefan-Boltzmann applies to ALL bodies, even transparent ones. It has no term for frequency. Even a gas has black body radiance. You are trying to add a term for frequency and remove the term for emissivity in the equation. That is where it began, yes. No. You can calculate it ACCURATELY with any body. The Stefan-Boltzmann law applies to ALL bodies.